Above - A Google StreetView Image of the Festival Theatre, Chichester - Click to Interact. The Chichester Festival Theatre was designed by Philip Powell and Hidalgo Moya, who were inspired by Tyrone Guthrie's Festival Theatre in Stratford Ontario. 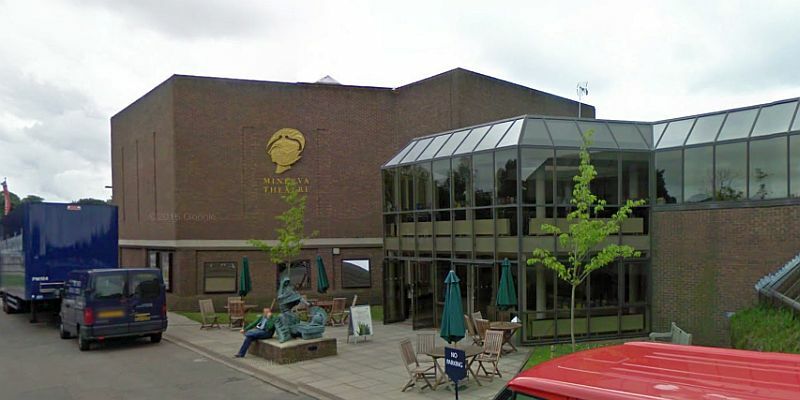 The Chichester Festival Theatre, which cost £95,000 to build and opened on the 6th June 1962, was the first Thrust Staged Theatre to be built in the United Kingdom for nearly 500 years. 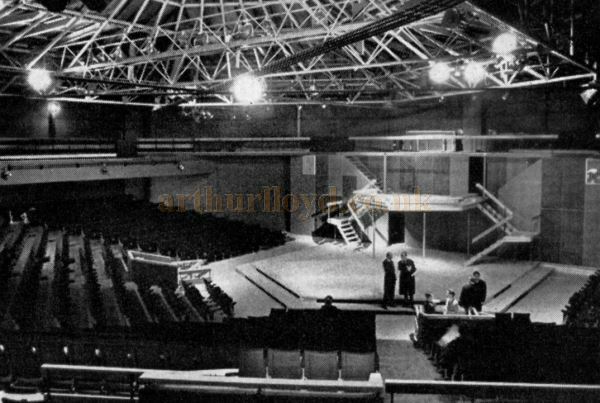 Right - The Auditorium and stage of the Festival Theatre, Chichester when it was first built in 1962 - From 'Theatre World', July 1962. Founded by Leslie Evershed Powell, the Theatre's first Artistic Director was the much loved actor Laurence Olivier who of course would go on to run the National Theatre Company at the Old Vic in London the following year. This Company would eventually find a new home in a purpose built Theatre on the South Bank of the Thames, the National Theatre, which opened in 1976. It's Olivier Theatre is similar in style to that of the Chichester Festival Theatre but with a less projecting thrust stage. The Festival Theatre's unusually shaped auditorium which wraps around its large projecting thrust stage could seat 1,340 people when it first opened. In 2012, during the Festival Theatre's 50th anniversary year, a redevelopment project was launched, and eventually achieved for its reopening on the 17th of July 2014 by Haworth Tompkins, whose scheme included removing additions which had been added to the building over the years and remodelling the auditorium to provide an altered and increased rake with refurbished seating for 1,316. The alterations improved the sight lines and brought the audience closer to the stage. At the same time the Theatre's original stage floor was replaced and Foyer spaces were enlarged and improved with better lighting and more toilet facilities. Some of the Theatre's original stage boards were rehoused in the Theatre's Green Room. The Theatre today also has cafes and bars with outdoor terraces, and is fully accessible. The Theatre also has its own Studio Theatre, situated adjacent to the original building, called the Minerva Theatre, which seats 283, and opened in 1989. Above - A Google StreetView Image of the Minerva Studio Theatre, Chichester - Click to Interact. You may like to visit the Festival Theatre's own Website here, which also has another fascinating Website dedicated to compiling the Theatre's history here. 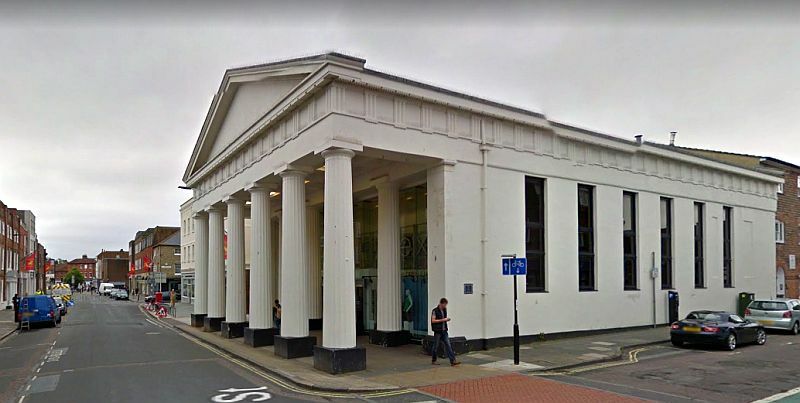 Above - A Google StreetView Image of the former Corn Exchange, Granada Exchange, Chichester - Click to Interact. The Corn Exchange building first opened in 1832 as a Market Place for Corn Merchants and Farmers but would be taken over by Joseph Poole in 1889 who began producing entertainments in the building such as the Chichester Minstrels, and was soon showing early Kinematograph films. By 1910 Poole was screening films in the building regularly along with various stage productions, but in 1922 it went over to full time Cinema use. A few years later the building was remodelled by the architects G. S. Hall and G. de Wild and reopened as the Exchange Cinema on the 8th of December 1927. 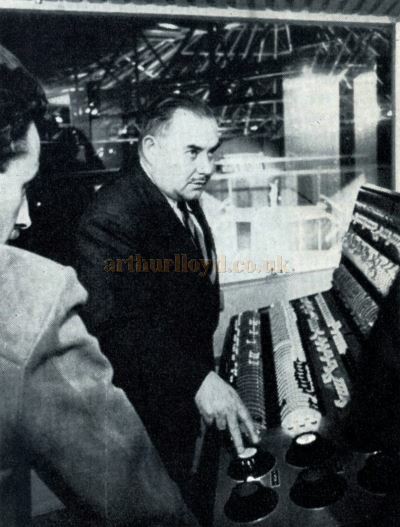 In 1948 the building was taken over by Granada Theatres who brought in the well known Theatre architect Robert Cromie to refurbish the Theatre. It reopened as the Granada Exchange on the 22nd of November 1948 and ran as such until a failed application to convert the building for Bingo in 1979 forced Granada to close down the Grade II Listed Building as a Cinema on the 9th of August 1980. The building then remained closed and unused for a number of years until it was finally remodelled and reopened as a branch of the MacDonald's fast food chain. Several other uses have come and gone over the years and today, although its Facade remains as it was when it first opened in 1832, its original interior is nowhere to be seen.